My colleague Karri was telling me about some research on webinars she had seen recently. The takeaway was that, shockingly, people didn’t like to sit through an hour of a video webinar* to get the five minutes of information they had been promised. Karri then shared her idea that maybe people (including us) should be putting up transcripts with their webinars. Marketers should think of webinars as platforms, not as presentations. Marketers think of webinars as, well, seminars on the web. The word lecture goes back to the 14th Century (meaning ‘to read’ — yes, they had Death by PowerPoint even in the Middle Ages!). We’ve been running marketing seminars ever since there was marketing, and we’ve been doing online seminars ever since there’s been an online. Webinars thus mimic the attributes of live, in-person seminars. Their primary purpose is for attendees to watch and listen to the presentation. They have a live chat for questions. They’ll let you pass the mic to another speaker. They have polls that are like asking for a show of hands. They have document sharing, which is like passing out handouts. All great. But that ignores that fact that you now have a bunch of live humans, logged in and identified, hanging out in a private space on a digital platform where you can track every single thing they do. And you make them sit in their seats and watch a product marketing manager read some slides. Good Lord, what a waste. At this point, the pedagogically trained among you are no doubt about to leave a comment telling me that research shows that people will learn better if forced to sit still and watch the presenter. I’ll concede that most people will have better retention if they pay attention to what the speaker is saying. But folks, (1) we’re talking about marketing seminars, not calculus lessons; and (2) your audience is watching you from inside a tabbed browser! I’m pretty sure they’re already reading the news or writing an email rather than watching your slides. Or in at least one case I know, managing their Dwarf Fortress. Poor dorfs. I will admit to a pathological hatred of presentations that colors my opinions about webinars. I drew cartoons during class all the way through my PhD and only recently have forced myself to stop drawing robots in my notes when meeting with executives. Mandatory corporate training makes me want to do things that are definitely against HR policies. I’d rather read a 500 page book than sit through a certification class. These traits have led me to the opinion that marketers should recognize that everybody does not learn in the same way, and that they should remember that all marketing is about the customer, not about them. 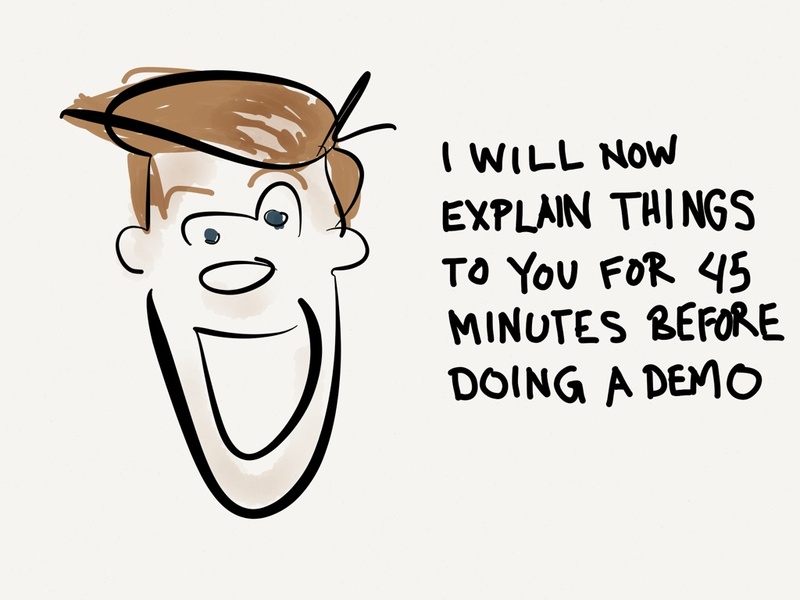 So instead of sit-down-shut-up webinars, why don’t we have platforms that offer added value to participants while they are gracing you with their presence? You could make available to attendees all sorts of transcripts, white papers, supplemental downloads, diagrams, slides from the presentation, one-sheets to show to their ADD boss, demos, blog articles, ROI calculators, RFQ forms, and other things to do while they’re at your presentation. What if there was a permanent forum where they could come back next week to ask a question? What if the attendees could be in a live chat room before or after the presentation? What if you broke into small groups for an exercise during the event? What if there were follow-up classes immediately after the current session? What if during the presentation, attendees could share a slide on Facebook or Pinterest? What if they could push out a promotional video for the next session of this webinar? What if they could see their Facebook friends and start whispering to them? What if people could download diagrams and presentation notes to incorporate in a blog post? What if, during the presentation, key quotes and takeaways appeared on the screen with a Tweet button beside them? What if attendees could recommend the product during a webinar while they are still in the midst of the aha moment? This is a digital platform; we can make it do anything. And after the session, you can score each attendee with points for every asset that they touch and every activity they do, and at the end you’ll have a list of everybody who is interested in your product. If you are a lead-generation marketing manager, you might be getting a little flushed at this point. We started off by talking about transcripts, which implies a recorded presentation, and now I’ve just talked about a lot of live features. There’s a full separate discussion to have about the value of live events vs recorded ones, both to marketers and their audience. Let’s have that another day. But since transcripts started this, let’s talk about them for a second. Transcripts are cheap in this context; services start at $1/minute and go up from there to several dollars a minute. You can spend less using something like Amazon’s Mechanical Turk if you want to exploit your fellow humans by paying them sweatshop wages. The transcript that comes back often has problems, especially for technical topics, and so someone has to go through and clean it up. Even after they are correct, transcripts are exceptionally tedious to read; I’m grateful for journalists who selectively quote their sources to get the gist of the matter! However, the point of transcripts in this context is not reading them through. The point is scanning them quickly to find out the scope of the presentation and the information you were promised when you were pitched this event. Karri, who had the original idea, had wanted to see the “5 Things You Should Be Doing” she was promised in a webinar, but then had to wade through the whole hour to find out what they were. I remember webinars that blathered on forever until finally showing me the product demo I had signed up for. We would both have been grateful for a published transcript or a couple of downloadable screenshots. I’m sure there are very good reasons why marketers don’t treat webinars as platforms. “Adding more options reduces the number of people who take the next step.” I would not be surprised if this is true, but I’d like to see some evidence. Having too many distractions in the presentation may cause people to freeze up with the paradox of choice or be too distracted to see the sign up for a sales call. If true — that is, if these crazy ADD webinar platform thingies that I’m describing here honestly don’t perform better in convincing people to go on to the next step and to have a conversation with you, then I’m just completely wrong and this whole rant is a bit beside the point. But bear with me if you’ve gotten this far, because I think we’re still going in an interesting direction. “Having too many things on the page confuses people and looks ugly.” The trend in web design is toward simplicity and away from link stew. In the wrong hands, which in this case is marketing’s hands, this could indeed turn really ugly. “The software doesn’t let me do this.” True for now; thus this rant. However, I’d bet there are some startups out there that have thought about this and I’d like to be told that this all already exists. There are reasons that are right but also wrong. “Adding more things inside the webinar doesn’t drive more registrations.” Since all the good stuff is after you register and nobody reads the details, everybody will be expecting a normal webinar and about the same number of people will show up. Marketers get judged on how many people show up, so why bother? The people who do show up will be better served, but I don’t like to come between people and their bonuses. Try to get your MBO goals changed. “If people don’t stay for the full hour, they won’t feel like they got value from the webinar.” Psychology is weird. If people pop in an out in 5 minutes, which they might do if they could find out the fact they wanted, they might indeed feel less of a bond or obligation or favorable feeling than if they stuck around for an hour. Again, I’d like to see evidence on this. On the other hand, you saved them an 55 minutes, which they might appreciate. “People need some time to sleep on the information I’m giving them. Then I’ll send them a follow-up email just when they’re ready.” This might be true. Again, the psychology of decision-making is twisty. But why not give them the white paper and transcript now, and then still send them the nurturing email in a week? “I’d rather create more webinars than more complicated webinars.” Fresh content drives activity. Talking live over some slides is the cheapest way to make fresh content that I know of. All this other digital platform stuff and finding extra assets will cost more, either in time or in dollars. On the other hand, better content trumps more content. “This won’t work on mobile.” Yes, true, you don’t have the screen size to be showing the user all sorts of geegaws. But also no, you’re probably displaying this in some presentation app already; in this future webinar utopia that we’re describing, the app should have all sorts of options to display more assets and go deeper into your product before, after, and during the presentation. And there are certainly some dumb reasons. “They owe me their attention for a full hour. If I give away the good stuff in a transcript, nobody will stick around.” This is not about you. The attendees are paying you with an hour of their attention. Respect that. “I want people to watch my webinar, not looking ahead in the slides.” You must have had grade school teachers that punished you for reading ahead in the book and that has warped your worldview. We’ve already established that people are multitasking. Wouldn’t you rather them read your white paper than Reddit? “I don’t want to spend all my digital assets in one place. I dribble them out like precious diamonds.” That’s smart. Assets are expensive. Instead, load up with non-gated assets that are already available on your website. After all, your prospects are right there and interested — why not give them some material that you have already created that they’re now ready for and that will lead them further along the buying journey? “I already have a campaign microsite and it’s branded and customized and I paid a lot of money for it.” Fabulous. I hope you get a bonus this quarter. While in my perfect future we’ll all have branded and dynamic webinar platforms that will let you set your asset list in 14-point Frere-Jones Gotham over a retina full-bleed stock photo image with a small depth of field for that awesome blurry bokeh, you’ll do just fine with an HTML list of links in Verdana. I promise if the content is interesting, people will read it and share it. “I share all that stuff in emails for my lead nurturing campaigns. I don’t want to use it now.” What are your open and click-through rates again? Nobody reads your nurturing emails. “People won’t retain my messages if they are clicking around.” True only if you are giving a technical deep dive. For everything else, I promise I can follow along while browsing. Presentations are an extremely low-bandwidth communication channel. Remember also that not everybody learns in the same way. “People just expect a normal presentation.” Perhaps, if marketers provided a greater value to webinar attendees, they’d get more registrants. “My boss doesn’t understand it.” Do one on the sly and then show them the results. We are now three decades into this online thing. It took time for radio to stop being just a broadcast of a live performance, and it took time for TV to stop being radio with pictures. It took time for web sites to stop being static and start being interactive and social. It’s time for our online webinars to stop aping the structures of the previous platforms and develop their own behaviors. We need digital interactive marketing platforms, not webinar platforms. This software doesn’t exist yet as far as I know, and done poorly it could even reduce your effectiveness. But I think we as digital marketers need to approach the webinar differently. We owe it to our potential customers who give us their time. So as you put together your next webinar, try to think of it as a digital platform. What other good stuff can you give to your audience? What delightful user experience can you create? How could your follow-up be even more useful? What kind of webinars would you invent if they were attractions at Disneyworld? If they were a raid in World of Warcraft? If you had all the engineers at Facebook at your disposal? What if your webinar were amazing? Your blog has many parallels with Kevin Spacey’s speech discussing the changes sweeping the stage, film and television industries – a bit like the changes affecting marketing and the way many marketers approach social and webinars. I could go on quoting many, many parts of his speech – as a marketer myself there are many lessons, but in the end to make an audience resonate with your message you need a great story and a great story teller. The rest is just the execution and channel strategy. John, great article- gave me some things to think about- like starting my own company to build this- although there are platforms like on24 and inexpo that offer much of what you mentioned- but are missing some of these great ideas. Thanks for the rant- loved it! One thing that immediately springs to mind (and doesn’t require coding a new platform or features) is running a genuinely interesting parallel survey or polls during the live event. If you post the link to the survey or poll during the event in the chat window so people can easily click it and ASSUME they can multitask and answer it while listening in another tab, you could have some solid interactivity. Making sure the speakers repeatedly call it out at multiple points during the regular webinar presentation it would likely get more traction. Inviting them to listen and actively multitask on something value-added during the webinar could be a killer combo, realizing as you said, that they’re doing other things anyway during the show. Love it – I have to comment as someone who does a lot of training via the web. Most of what I see in webinars is just flipping boring. Boring. BORING. I think that the fabulous stuff you describe is, well, fabulous! Great! Hooray! We should definitely do ALL of those things. Or at least attempt them. But technology won’t overcome a presentation that is a boring lecture. I suggest – start with your best shot: a 10 minute demo that shows ONE really cool thing that you can do. A clean demo, without a million bells and whistles and sidetracks. THEN, I believe that 1 – you will have built some credibility 2 – your audience may be more willing to stick with you for the details 3 – they may be more willing to pick up your links and read them 4 – even if they leave early, they will have seen something memorable.